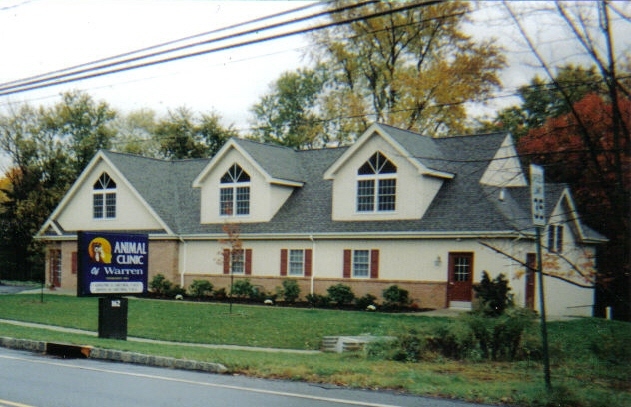 Animal Clinic of Warren, PA. in Warren, NJ has been treating the area's cats and dogs since its founding in 1969 and is one of Warren Township's oldest professional businesses. We have two full time veteranarians on staff - a Father - Daughter practice. This provides your pets with consistent, compassionate care combining the Father's 44 years of experience with the Daughter's 11 years of knowledge of the latest available therapies and technology. We moved our hospital in June 2000 to a brand new state of the art facility. We have 2 exam rooms,an in-house laboratory and pharmacy, digital x-ray, EKG/ultrasound room, surgical suite with laser technology and monitoring equipment, dental station, flexible and rigid fiberoptic endoscopy and expanded kennel facilities. We want you to feel welcome by providing FAMILY care to you and your pets. We strive for excellence each and every day. Our clinic is open 6 days per week and runs on an appointment basis. Please feel free to call or stop in! Thank you for taking the time to read about our veterinary practice and the services we offer. We welcome your comments and suggestions. Please contact us at (732)356-9889 for all your pet health care needs.